Philly’s MarQ Spekt is out to be a rap game sommelier, seeking complimentary producers to pair and conduct the musical direction of his albums. On 2011’s Machetevision he collaborated with Kno of Cunninlynguists. For the recently released JustPlayWitIt, he enlists the production of Ninja Tune beatminer Blockhead, who’s previous collaborative records include Illogic, billy woods, and being the DJ Premier to Aesop Rock’s Guru early in his career. Much like his work on billy woods’ Dour Candy, the presence of Blockhead unifies Spekt’s album under dark passages that manipulate a melting pot of samples like a taxi ride through the indigenous sects of a metropolis. Spekt and Blockhead are self-sufficient in the duration of JustPlayWitIt. 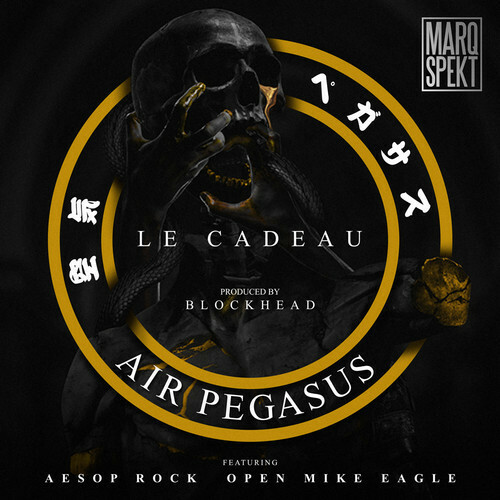 The track “Air Pegasus (Le Cadeau)”, which features Open Mike Eagle and Aesop Rock, did not make the album, instead Spekt kept it as a special bonus, a dessert to the main course. MarQ Spekt’s label hipNOTT elected to set the bonus cut free recently as a download on Soundcloud. The noir bassline of “Air Pegasus” guides the rappers into the recesses of their psyche as Open Mike Eagle ponders who the fourth place setting is for at this three-person dinner table, Spekt has crazy visions of beating naysayers to death with drumstick, and Aesop Rock makes the sole reference to a horse, both the pale type to behold and winged one of mythology. MarQ Spekt & Blockhead’s JustPlayWitIt is out now on HipNOTT Records.